Eliminate entanglement of hooks set on lure! When carrying a lure put in a case, hook entanglement between lures is a big problem. Not only you can not make a quick lure rotation, you can also often drop the lure while unraveling the entanglement. This hook band that solves such troubles. 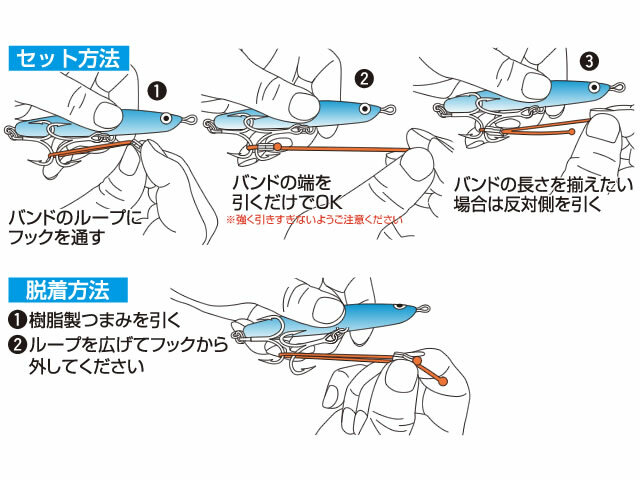 It corresponds not only to 2 hooks but also to 3 hook lures, just by fixing the hooks in the band, the hook entanglement is drastically decreased. Easy to set, easy to remove special grip mounted, instant detachment is OK. It is too convenient and can not be stopped once it is used.